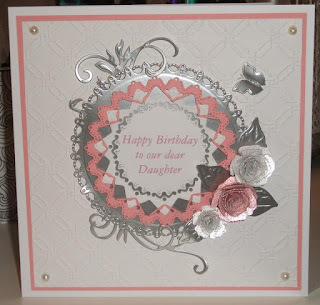 Next to stamping my favourite papercrafting has to be making cards with Spellbinders, so when I saw the challenge was 'Circles ' my first thought was which spellbinders shall I use? I started by making the background using Spellbinders M-Bossibilities Garden Trellis folder(design B).Then the base of the circles was cut using the smallest of the Grand Decorative circles which was then topped off with a couple of layers of Exquisite Circles dies. I finished it off with three roses cut with Bitty Blossoms dies and some die cut leaves and a couple of swirls and a butterfly. Just found your blog , Annie, love it.